Nice bag, Ben! 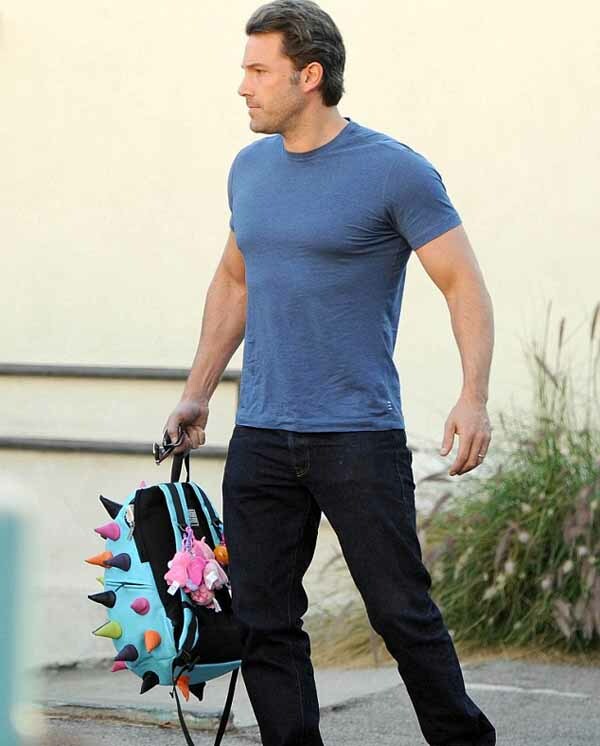 Affleck shows off his muscular Batman physique as he totes one of his daughters’ cute and spiky knapsacks. He’s looking mighty muscled up these days. 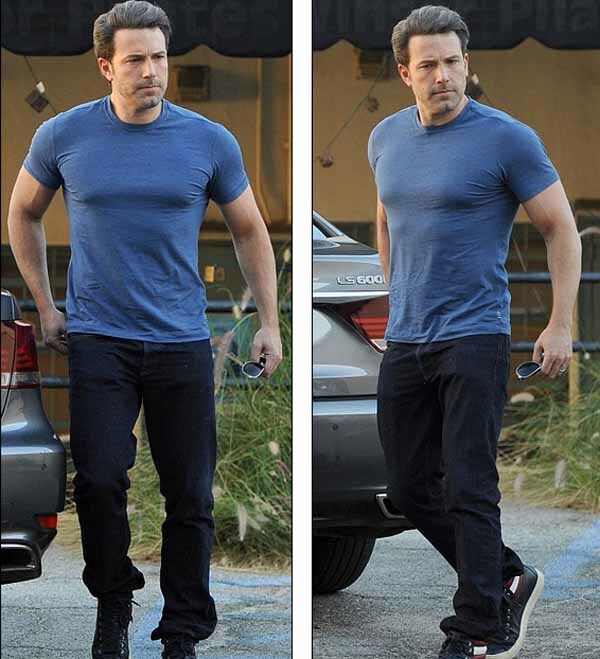 And on Thursday, Ben Affleck showed off the buff body he’s building for his role as Batman while out and about in Santa Monica, California. The 42-year-old looked ripped in a tight blue T-shirt as he carried one of his children’s MadPax Spiketus Rex backpacks. 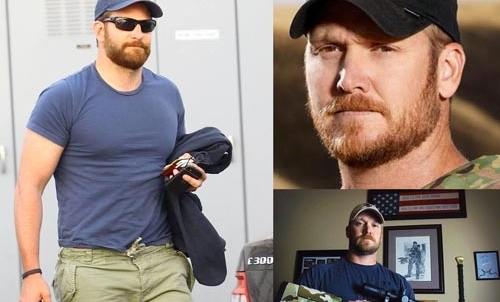 The super hero star, who also donned black jeans and Converse All Stars, may have been delivering the item to one of his daughters, Violet, eight, or five-year-old Seraphina. It certainly looked like a girly bag with soft spikes in lime green, pink, orange, blue and black plus cute little stuffed animals attached to the zipper’s fob. The Boston native looked very serious as he continued on his mission, with his beautiful thick hair combed neatly back. His normally dark locks were showing signs of gray but whether that’s his natural colour or dye for a role is hard to say. The Gone Girl star is much in demand on the big screen nowadays. 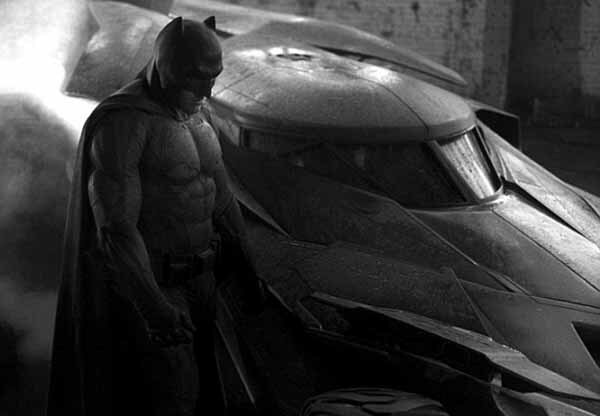 Aside from Batman V Superman: Dawn Of Justice, which is due out March 25, 2016, Ben is booked up until 2019. Upcoming films include The Justice League Part One with Part Two slated for release in 2019, plus Prohibition era drama Live By Night, due out October 7, 2016. 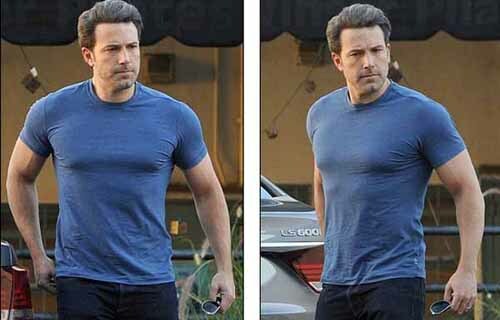 Ben is married to Jennifer Garner and the couple also have a son, two-year-old Samuel, as well as their girls. The couple met after starring in Pearl Harbour together in 2001 and Daredevil in 2003 and married in 2005.